Sledding is a popular activity for many kids during the winter. However, there are times when you may be in an area without a suitable sled. There are two options. You can buy one that might be pricey or you can make one using cardboard and duct tape. 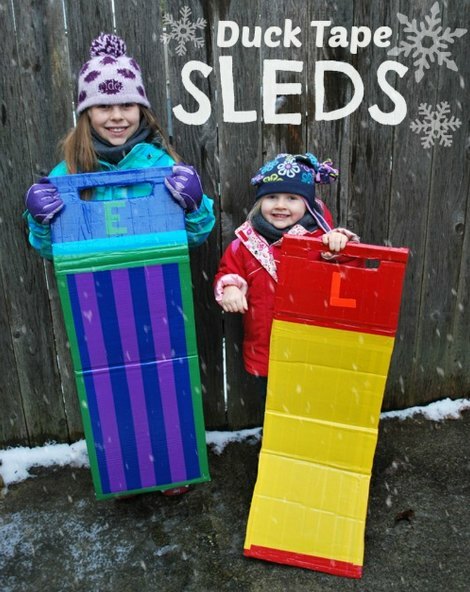 A duct tape sled is really easy to make and the materials are not expensive. You can easily make a duct tape sled using any type of cardboard on hand. However, you may see that any moving boxes may work best. There is also the option to use a cardboard from an appliance. One thing that is crucial about making a duct tape sled is completely covering the cardboard. You do not want to have any cardboard get wet as a soggy sled will not be fun. A basic duct tape sled can be made in any shape you prefer. The most common is a rectangle, but many shapes can be used. Some people may prefer a saucer shape or some other design. The main thing with any type of cardboard material is cutting the shape that is needed. This will be easier to do using a firm pair of scissors. The best thing about a duct tape sled is you can easily make any number that is necessary. You will see that this type of sled will eventually wear out from constant use. This is not a problem as this sled is an ideal solution for a temporary toy. Another sled can be easily be made when needed. The most important detail about a duct tape sled is finding the type of duct tape to use. Duct tape is not simply a basic sliver color. There are many colors available.